Fire Gypsy provides professional entertainment for Sweet Sixteen Parties in Massachusetts, Connecticut, Rhode Island, New Hampshire, Maine, Vermont, New York and anywhere in the USA or internationally! Having a Fire Performance at your sweet sixteen party is the perfect way to entertain your guests! A fire show will make your sweet 16 party a memorable experience for everyone of all ages. Imagine a fire eater and fire breather at YOUR sweet sixteen! Your guests will talk about the fire dancer at your sweet sixteen for years! 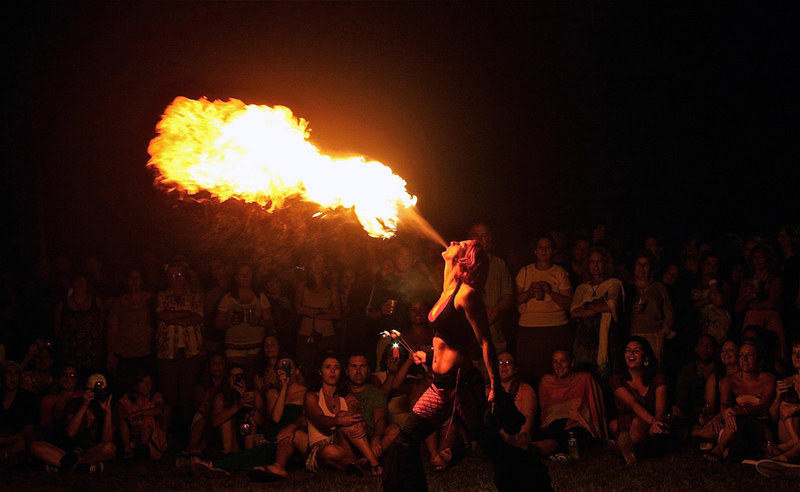 You'll see incredible fire acts such as fire belly dance, fire fans, fire staff, fire hula hoop, fire poi, fire hip belt with palm torches, and many more other fire props! You'll see Sasha execute moves like mind-blowing backbends as she spins balls of fire just inches from her face! Sasha can also be a part of your candle lighting ceremony and light each candle in interesting ways! Contact us to plan your sweet sixteen party entertainment with fire spinners and fire twirlers today! You can have your very own SIDESHOW at your sweet sixteen party! Shock your guests as a sideshow performer eats a lightbulb at your sweet sixteen! A sideshow performer will perform classic acts at your party such as the human blockhead act! Your sweet 16 guests will get to come up on stage and stand on Sasha's stomach as she lies on a bed of real sharp nails! Or how about hopping on a freakshow performer's back piggy back style as she walks on real broken glass! You can FEEL the glass breaking under your combined weight through her body! Watch as Sasha climbs a ladder made of real sharp MACHETES! That's right, a machete sword ladder! Have your mind blown as Sasha's swallows a whole 3 foot long balloon! Where does it go? Only one way to find out! Book a sideshow for your sweet sixteen party today! Light up your sweet sixteen party with your very own LED light show performer! You could have your very own LED Hula Hoop Dancer at your sweet 16! Sasha performs with a smart LED hula hoop that creates incredible mind blowing patterns! If you think you know hula hooping, think again! You'll see Sasha LED hula hooping on all different parts of her body that you never thought possible! Sasha also offers hula hoop parties! You and a designated number of guests will spend time making and taping your very own hula hoop and then do a group lesson! Sasha also performs LED poi dancing! Have a LED poi spinner at your sweet sixteen! Make your sweet sixteen unique by having LED light entertainment or a blacklight show! Book a LED light performer for your sweet sixteen party today! Bring the excitement level of your sweet sixteen party higher with a circus aerial hammock performer! Having an aerialist at your sweet 16 is a great way to wow your guests! You'll see Sasha perform stunning acrobatics in the air and shocking drops! Whether your ceiling is 13 feet high or 30 feet high, Sasha has an aerial act that fits your venue! You could have your very own aerial bartender at your sweet sixteen! Sasha will pour your adult guests champagne or liquor while hanging upside down from her aerial lyra! Whether you have an aerial lyra hoop performer pouring champagne for your guests or an ambient aerial hammock act, your sweet sixteen guests will be mesmerized! Book an aerial artist for your sweet sixteen party today! Power tools meets performance! The unique angle grinder girl show is a great way to spark up the excitement at your sweet sixteen party! This high RPM act combines a power angle grinder and custom steel armor to create shooting sparks! Sasha takes her grinder to the different custom steel plates on her shins, arms, and chest! You'll see Sasha create sparks that pulse with the beat of the music and watch as she puts her hand in the stream of sparks! Having an angle grinder show is the perfect way to surprise your guests, or even book a show to surprise the guest of honor! Your sweet 16 guests will never stop talking about that girl who showed up and put on a grinder sparks show! Book a grinder girl sparks act for your sweet sixteen party today! Bring your imagination to life with a real live mermaid at your sweet sixteen party! You can have a mermaid swimming at your sweet 16 pool party! Mermaid Sasha will swim in your pool with your guests and play with the kids! If you don't have a pool at your house, hotel sweet sixteen pool parties are perfect for a mermaid! Mermaid Sasha can also sit out of the water and pour champagne or liquor for your adult guests, take pictures with your guests, and even sit in an aerial lyra! Sasha also does mermaid tail sweet sixteen parties and can make a custom mermaid tail for the birthday girl! Book a real mermaid for your sweet sixteen party today!